Outdoor School Furniture is the nation’s #1 source for outdoor tables! For 20 years, Outdoor School Furniture has been operating in the USA as a leader in the outdoor furniture industry. Our high-quality product selection includes all kinds of outdoor school tables, outdoor cafe tables, benches, bike racks, and so much more! •	First-Class Customer service. Taking care of our customers is our highest priority. •	Reasonable Shipping Rates. We work hard to keep shipping rates to a minimum. •	Member of National School Supply & Equipment Association (NSSEA). We’re a preferred provider of school tables and other outdoor school furniture because of our commitment to providing excellent quality at excellent prices. •	Safe Website. We take security very seriously; our website is Hacker Safe certified and uses the latest dedicated server SSL security protocols. Additionally, we will never sell your information, so your information is safe with us. Since outdoor furniture is our one and only business, we take the time to get it right. You won’t find better products anywhere, we guarantee! All our outdoor tables are made from heavy-duty steel. We offer a number of different style options to choose from, including perforated metal and a diamond-pattern grid. Many of our designs can also be customized, which allows you to add your own special touch to our designs. Our color selection is excellent, ensuring that you can find the design and color best suited to your design aesthetic. All our school tables have heavy-duty steel tube frames that are manufactured using the highest-grade strip steel that is galvanized using our very own, patented, in-line Flo Coat process. Flo Coat covers each tube with a proprietary combination of zinc, a conversion coating, and a clear, organic polymer top coat. This triple-layer dip provides powerful protection against corrosion. The result is a frame that will last a lifetime. In addition, all of our outdoor furniture pieces are covered in a thermoplastic powder coating with a copolymer base. This high-tech coating is 100% environmentally safe and it will never peel, crack, or lose its vibrant color. Thermoplastic is also another barrier against corrosion. Another important feature of this coating is that it’s easy to repair and maintain. Cuts in the coating will mend themselves when heated with a heat gun and graffiti is no match for vandals; spray paint just wipes right off when treated with a product such as WD-40™. We’ve put a lot of thought and technology into our products so that once you buy them, you’ll never need to think about them again. 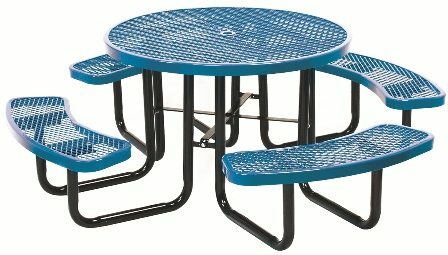 Outdoor tables from Outdoor School Furniture are they best you can buy in every way. All our products are made in the USA and adhere to the highest manufacturing standards. Our outdoor children’s tables and benches are built to last forever; no one makes outdoor furniture that is more attractive or more durable than Outdoor School Furniture! Call us today to invest in the very best! Purchase Your Outdoor School Table Here!